You will be picked up from your hotel at 9:00 a.m.The city tour begin with the visit to the Plaza the Armas, which has been declared a World Heritage Site by UNESCO. In the centre of the Plaza is a bronze fountain dating from 1560. Located in the Plaza is the Cathedral, note the splendidly carved stalls, the silver covered altars surrounded by fine woodwork, mosaic covered walls bearing the coats of arms of Lima and Pizarro. Next to the Cathedral is the Archbishop's Palace. Then you'll visit the the XVII century Monastery of San Francisco, this is famous for the Sivillian tilework and panelled ceiling in the cloisters, the catacombs under the church and part of the monastery are well worth seeing, You'll visit the old colonial streets in the centre of the city, and the modern Lima with the district of San Isidro and Miraflores. 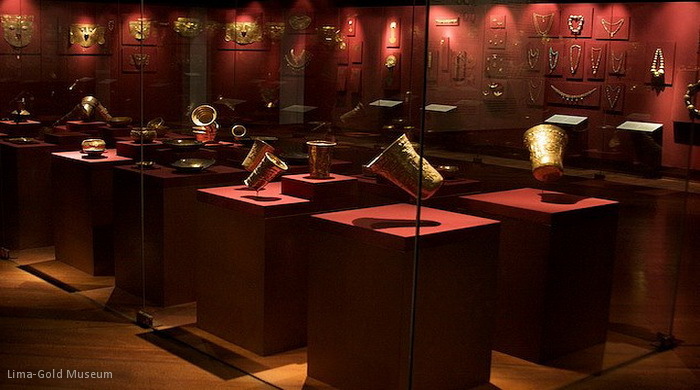 We will also visit the Peruvian Gold Museum, this excellent collection includes pre-Columbian gold, silver and bronze, ceramics, weavings, mummies, etc. Upstairs is a remarkable arms collections with an impressive exhibition from Spanish colonial times. At the end transfer back to your hotel.